Here is how Las Vegas star players, coaches, execs will be celebrating USA’s July 4 birthday…..
ADAM NAGLICH, LAS VEGAS GOAL SCORER IN ICE AND ROLLER – VEGAS HOCKEY HOF – “My family and I are heading to San Diego for the weekend. We had to beat the heat in Las Vegas so we decided to rent a beach house in SD for the weekend. MICAH SANFORD, HEAD COACH, AAA LAS VEGAS STORM 16U AND VEGAS HOCKEY HOF – “Our whole family is spending the 4th in Hot Springs, Arkansas on the lake. Lots of good Southern food there. We are going early Monday morning to go bass fishing – me, my brother and Dad. Goal scorer Gage Quinney of Las Vegas will be going to the NHL Pittsburgh Penguins Prospects developmental camp this weekend at the UPMC Lemieux Sports Complex in Cranberry, Pa. Gage, 20, is listed at 6’0, 201. He scored 30 goals for the WHL Kamloops Blazers last season. Las Vegas – Hockey coach Rob Pallin, the new head coach of HC TWK Innsbruck in Austria, said today there are four thing he looks for while looking at and recruiting top players. 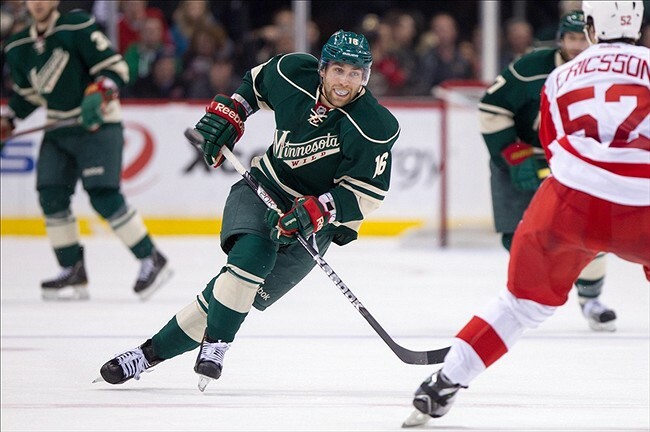 St. Paul, Minnesota – Jason Zucker of Las Vegas today re-signed with the NHL Minnesota Wild. Jason, who wanted to stay with the Wild, signed for two more seasons. Jason grew up playing hockey in Las Vegas. His last Las Vegas team was the AAA Las Vegas Outlaws 16u at the Las Vegas Ice Center. Las Vegas coach Rob Pallin announced he has signed goal scorer Andrew Clark of Brandon, Manitoba to play for HC Innsbruck in Austria. Rob is the new head coach of HC Innsbruck. He said Clark was a 100-point scorer in Denmark in 2014-15 and had 61 points in 51 games last year in the Swiss B League. Pallin will depart July 28 from Las Vegas to be with his new club HC Innsbruck. Las Vegas – Goal scorer Chris Francis of Las Vegas has signed to play for the ECHL Quad City Mallards in Moline, Illinois this season. First however, Chris will report to the AHL Iowa Wild main camp this fall. Iowa is an affiliate of the NHL Minnesota Wild. “I am happy to announce that I will be playing in North America this upcoming season,” said Chris. “I decided to sign a contract with the ECHL Quad City Mallards and will be entering the year at the AHL Iowa Wild main camp. “I am really excited to start playing again this season and happy to be in a great organization like Quad City,” he said. The Quad City Mallards are also affiliated with the NHL Minnesota Wild. “My goal is to play in the AHL for the majority of the year,” he said. Chris, 27, was one of the all-time goal scorers while playing in Las Vegas. He was a star goal scorer while playing 279 games in his four seasons with the WHL Portland Winterhawks, then skated for the ECHL Las Vegas Wranglers for four seasons, then the ECHL Alaska Aces for a season and last year for coach Rob Pallin with Sapa Fehervar A19 in Hungary. Las Vegas – Hockey fans from all parts of the world voted three from the WSHL Las Vegas Storm including the dynamic, lightning-quick Vincent Dekumbis, team leader Beau Ricketts and GM/Head Coach Gabe Gauthier who is also the Director of Hockey at the Las Vegas Ice Center to the Vegas Hockey Hall of Fame today. There was massive voting from readers of Vegashockey.net to determine who would be inducted into the Class of 2016. Dekumbis, from Fribourg, Switzerland, scored 48 goals in two seasons, was selected to the WSHL All-Star Team last winter and was named the ‘Fastest Skater’ among all of the All-Stars. He received the most Hall of Fame votes this week. Ricketts, a star player with the Helena Bighorns in his first season of junior hockey, played two seasons in the NAHL and then was asked by coach Gauthier to play for his hometown team the WSHL Las Vegas Storm two years ago. Ricketts, a powerful force with the puck, worked hard on the ice, scored 30 goals and led the Storm – in its first season – to the playoffs. Gauthier not only launched the WSHL Las Vegas Storm junior hockey program but as Director of Hockey at the Las Vegas Ice Center help to merge the Storm’s hockey program with cross-town rival Las Vegas Flames who skate out of the SoBe Ice Arena. When that was accomplished Gauthier announced the Storm would put together an AAA Las Vegas Storm 16u tier travel team for 2016-17. Megan Myers is the first from Las Vegas to play in professional women’s hockey. She skates for the Boston Blades, is a dynamic team leader and she also coaches women’s college hockey. Megan recently played for the Orange County Blades women’s roller team – Platinum level – last week at the NARCh West Finals in Huntington Beach, Ca. Spike Neely was a high-action player on the first powerful line in Las Vegas, the ‘Triple Threat Line‘ which included Travis Roseberry and JC Caron for the 1999-2000 AA Las Vegas Mustangs coached by Rob Pallin. It was Pallin who said Spike was “all heart” and today Vegas Hockey’s All Heart awards are named after Spike Neely. Zach Pochiro, a draft pick of the NHL St. Louis Blues, was a star player for the WHL Prince George Cougars for three seasons, then began to play professionally in the Blues system. He skated for the ECHL Quad City Mallards for most of last winter. Mike Trimboli was a star defenseman for four seasons with Utah State which was a Western Top 10 power each year. He is a very popular Las Vegas player. Cory Ward scored 67 times in his career with the NAHL Aberdeen Wings, then played in a team record 151 games for NCAA Bemidji State where he scored 45 goals. When his college career was over last winter, Cory was signed by the AHL St John’s Icecaps who are affiliated with the NHL Montreal Canadiens. Las Vegas – That’s it, the voting is over. A record number of votes came in for the Vegas Hockey Hall of Fame Class of 2016. Votes came in worldwide and records were set for the top two winners. Thank you to all who took the time to send in your votes for deserving players, coaches, media and hockey executives. The winners will be announced here on Tuesday.